Wilson Yates is president emeritus and distinguished professor emeritus of religion, society and the arts at United Theological Seminary of the Twin Cities. He is an ordained minister in the United Methodist Church with dual standing in the United Church of Christ. He is the founder of ARTS, and served as its senior editor for 25 years. He has written extensively on the arts in theological education, and is considered one of the key educational figures in the dialogue between art and theology. Art + Religion in the 21st Century is a welcome addition to the literature on religion and art. 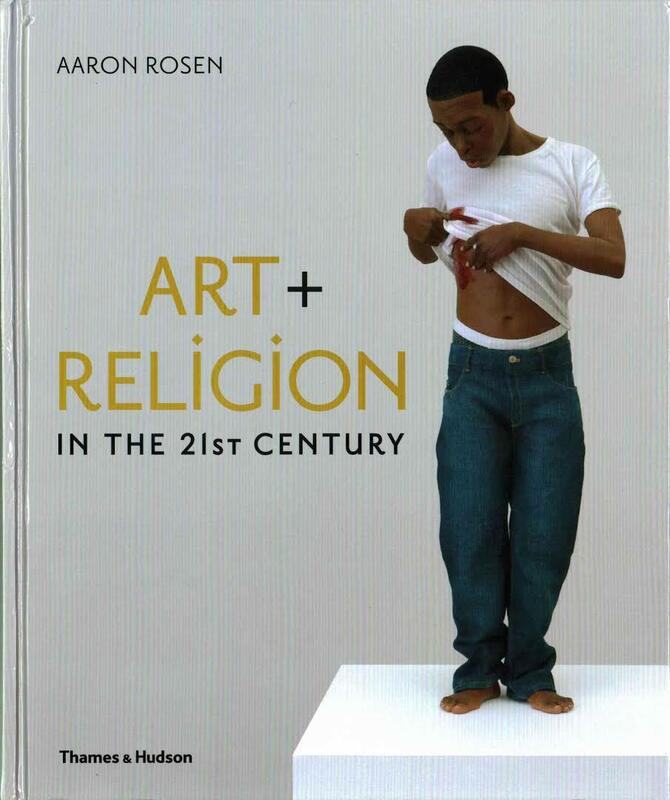 The author, Aaron Rosen, provides a lively and well-written essay on some of the complex intersections between contemporary art and religion, and the book is filled with beautiful reproductions and an insightful selection of art works, as well as engaging quotes from various artists regarding the religious aspects of their work. we might add, which have been there in one form or another since the Renaissance and the Reformation—should become “a tremendous potential for reciprocity” (17) that could lead to a constructive dialogue between artists and those speaking out of various religious traditions. (One might note that at no time in 20th-century art has religion been more under the scapel than it has been while in the hands of the surrealist. Indeed, Max Ernst and Wilfredo Lam chose to treat religion in a fashion that make Ofili and Serrano mild pudding for provocateurs’ tastes, so this is far from a uniquely contemporary phenomenon). It is important to recognize the boundaries that define the focus of Rosen’s discussion. This becomes particularly important since the field of inquiry in religion and art is broad and interdisciplinary, and it is one that finds ready attention in a diversity of disciplines including theology, aesthetics, the social sciences, ethics, and church history. In light of such a range of possible avenues for exploration, Rosen narrows his own interest to a concern for that which has been “shaped . . . by recent debates within religious studies . . . [and] significant changes within art history” (19). In light of this interest, he limits his inclusion of larger disciplinary concerns to ideas coming most extensively from the field of cultural studies and its focus on gender, race, and sexuality. Acknowledging this interest, however, it is at times difficult to know exactly what the recent debates in religious studies and art history are that concern him so greatly, short of the reader seeking threads of identity in the ongoing text. Exploring these religious subjects, however, Rosen does show us how specific works invite theological reflection. He shows how artists raise religious questions, explore dimensions of spirituality, identify their sense of the sacred, explore images of the “fall,” envision new images of human possibility and, more specifically, he shows how artists are concerned with love, the sacred, embodiment, pathos, loss, redemption, evil in the world, as well as with evil itself. Further, he presents artists who draw on biblical images including those of creation, the fall, the nativity, the crucifixion, the pietà, and the arts of sacred space. But having done as much, he does not press any theological interests, nor does he move greatly beyond summary considerations of the artists and their works. Perhaps I am asking too much, for he does well in showing how the works raise questions of theological interest. But one wants him to press the artists’ religious questions or affirmations with some further measure of theological probing. Let me cite an example. He offers us Sam Taylor-Johnson’s Pietà—a 35mm film still. Rosen observes that Taylor-Johnson “captures the commiseration of friends, supporting the actor Robert Downey, Jr.—who had recently emerged from rehab—as he begins to stir to life” (50). The quote used to focus our attention on the religious dimension of the work refers to Taylor-Johnson’s video for Elton John’s “I want Love,” the lyrics of which are seen as reinforcing the pathos of her Pietà. “I want love, but its impossible; A man like me, so irresponsible; A man like me is dead in places; Other men feel liberated” (65). Rosen’s presentation begs for a theological discussion in which the matter of pathos, Taylor-Johnson’s Pietà, the biblical pietà, the artist, and both the subject as well as formal aspects of the scene, including the lyrics, are discussed in such a way that some more nuanced meanings might unfold—or not. The artist Francis Bacon once said that he dealt with crucifixes not because of an affinity with the Christian crucifixion but because the crucifixion in western civilization is “an armature of feeling” which all know because of its ready emotional significance. Is the artist using the pietà as such a generalized armature of feeling, or with greater affinity for the religious image of Mary and Jesus? I wish that Rosen had pushed deeper into the works either theologically or even simply from the perspective of his own lenses of cultural studies and art history. A further question on Rosen’s boundaries relates to the matter of how we should define religion. He dismisses the 20th century’s effort to create working definitions. He does not mention whose definitions we are dismissing—Weber’s, Bellah’s, Tillich’s, Rahner’s—but turns to cultural studies with an observation that “Over the past couple of decades . . . emphasis has shifted away from taxonomy, seeking to establish what makes religion distinct from other phenomena, of thinking about it as a lived experience inextricable—and sometimes indistinguishable—from other cultural practices” (7). Well and good, but I could not help but wonder what Rosen might have done with Paul Tillich who would have agreed that we need to move away from a taxonomy of parts to lived experience and who, in so doing, would have maintained that religion is one’s “ultimate concern”—that is, the religious experience, or what some would call the spiritual experience, is an experience of what is considered Ultimate, be it God or atheism, capitalism or socialism, family or community, love or justice, or the creative process of making art itself. Indeed, when we do listen to some of the artists speak about the religious side of their works, they are speaking about what they deem to be ultimate in their own lives. But my point is not, finally, Tillich, but rather to suggest that it would have been helpful if Rosen had not dismissed so easily the efforts to define religion in the 20th century. Indeed, if he had examined Tillich, Bellah, and Eliade, he might have found the roots of his own interest embedded, in part, in their analytical efforts as well as those of more recent scholarly discussions. A part of my concern in making these points is that Rosen does not engage other writers in significant conversation. There are no footnotes, but one would think that his reliance on cultural studies would have led him to some recognition of David Morgan, or his references to the importance of Picasso and Warhol might have elicited a comment on the works of Jane Dillenberger. His consideration of the sublime and the beautiful might have led to at least some recognition of the role of theological aesthetics or the work of Frank Burch Brown in aesthetics or, in treating the idea of embodiment, to the work of James B. Nelson, the absence of which is a bit jarring. In treating civil religious rituals, he might have lingered a bit with Robert Bellah’s treatment of civil religion, which would have located more fully a number of the artists he treats. And he may have made some references to ritual studies—Eliade, for example. But Aaron Rosen does give us a wonderful panoply of works and invites us to consider their religious contributions. He offers a careful delineation of themes artists speak to in their works, and he provides an exceptionally well-selected set of works that invite rich exploration through those themes. Theologians should be interested in his work, therefore, for he selects works of art that invite us to engage in dialogue with artists and with their works. He offers us rich ground that invites “reciprocity.” Perhaps his invitation is enough.